Precious metals advanced for a second straight session in pre-holiday trading Wednesday. Markets in the U.S. are closed Thursday for the Thanksgiving holiday but they re-open on Friday. Gold for December delivery added $10.50, or 0.8%, to settle at $1,292.20 an ounce on the Comex division of the New York Mercantile Exchange. "The precious metals markets got buying support come from outside markets that were in a bullish daily posture — a solidly lower U.S. dollar index and higher crude oil prices," Jim Wyckoff, a senior analyst at Kitco Metals Inc., said in a daily report. "This afternoon’s release of the minutes from the last Federal Open Market Committee (FOMC) meeting showed members somewhat concerned about continuing low inflationary price pressures. The markets moved very little on the FOMC minutes release, which contained no surprises," he added. 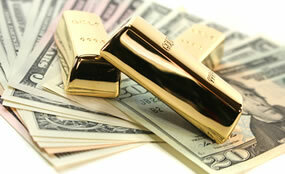 Gold futures ranged from a low of $1,278.60 to a high of $1,293.30. They rose 0.5% on Tuesday and dropped 1.6% in their start to the week on Monday. Silver for December delivery gained 15.2 cents, or 0.9%, to settle at $17.112 an ounce. Silver futures traded between $16.92 and $17.13. They rose 0.7% in the previous session and sank 3.1% on Monday. January platinum added $2.70, or 0.3%, to $940.70 an ounce, ranging from $932.50 to $942.70. Palladium for December delivery rose $5.45, or 0.6%, to $1,001.95 an ounce, trading between $994 and $1,003.30. Gold gained $3.65, or 0.3%, to 1,286.95 an ounce. Silver slipped 3.5 cents, or 0.2%, to $16.965 an ounce. United States Mint bullion sales were unchanged as of 2:38 p.m. ET. Below is a sales breakdown of U.S. bullion products with columns listing the number of coins sold during varying periods. Products with an asterisk (*) are no longer available. HAPPY THANKSGIVING! I am thankful for my family, friends, & the great hobby of numismatics & for those who share their knowledge in our special areas of collecting. Palladium is at $1003 today in London – $70 more than platinum per ounce. Amazing once again this year!